We are offering Black Non-Stick Appachetty to our clients. 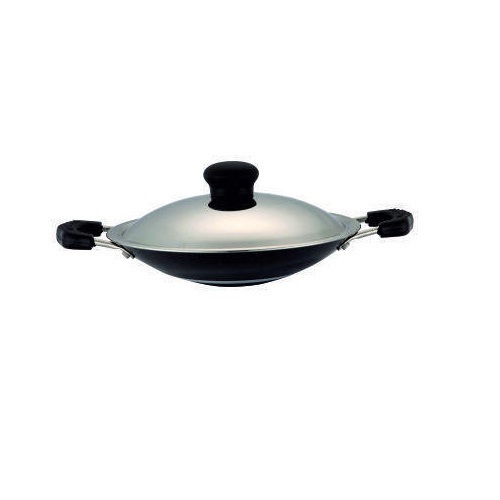 We M. G. Kitchenware are engaged in manufacturing, supplying, exporting, importing, wholesaling and trading a quality assured range of Pressure Cooker, Non Stick Fry Pan, Non Stick Tawa, Non Stick Kadai, Non Stick Appachetty, Aluminum Milk Pot, Aluminum Sauce Pan, Aluminum Kadai, Aluminum Cooking Pot, Aluminum Milk Pan, Aluminum Fry Pan, Stainless Steel Hot Pot and many more. Our trading brand names are Deccan, Nandi and Marcopolo. We are sole proprietorship company that was established in the year 2007. We have emerged as a largest kitchen appliances company catering to the needs of homemakers in the country as well as abroad. 20-40% of our products are exported to Dubai and Saudi Arabia. Over the years, we have expanded our business all over the world due to the support of our diligent workforce, advanced infrastructural unit and wide distribution network. All the products are manufactured on the pillars of safety, innovation, durability and trust that make them first choice in millions of homes. If the buyer wants to procure sizable quantity of our product in their own brand name regularly, we can manufacture this in buyer’s own brand name as per the applicable terms and conditions.